Below you fill find all funeral homes and cemeteries in or near Wenatchee. Suburbs of Wenatchee: Appleyard, E Wenatchee, Grant Road Addition, Kenroy, Mission Square, Pearcot, Wenatchee Heights, West Wenatchee. Wenatchee is also known as: Chelan County / Wenatchee city. Their current mayor is Mayor Wenatchee City Council. Zip codes in the city: 98801, 98802, 98807. Some of the notable people born here have been: Tyler Farrar (professional road racing cyclist and athlete), Kurt Schulz (american football player), Casey Parsons (baseball player), Rodleen Giecek (songwriter and singer), Chris DeGarmo (guitarist), Peter Sirmon (american football player and coach), and Aubrey Dickinson (actor). Wenatchee (/wɛˈnætʃiː/ US dict: wĕ·năt′·chē) is a city located in north-central Washington and is the largest city and county seat of Chelan County, Washington, United States. The population within the city limits in 2010 was 31,925. The population was 33,070 at 2014 Estimate from Office of Financial Management. 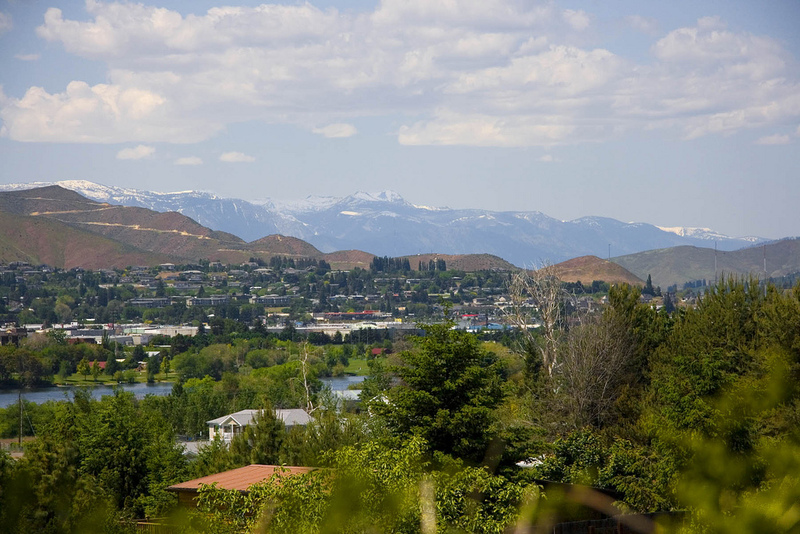 Located at the confluence of the Columbia and Wenatchee rivers near the eastern foothills of the Cascade Range, Wenatchee lies on the western side of the Columbia River, across from the city of East Wenatchee. The Columbia River forms the boundary between Chelan and Douglas County. Wenatchee is the principal city of the "Wenatchee–East Wenatchee, Washington Metropolitan Statistical Area", which encompasses all of Chelan and Douglas counties (total population around 110,884). However, the 'Wenatchee Valley Area' generally refers to the land between Rocky Reach and Rock Island Dam on both banks of the Columbia, which includes East Wenatchee, Rock Island, and Malaga.The city was named for the nearby Wenatchi Indian tribe. The name is a Sahaptin word that means "river which comes [or whose source is] from canyons" or "robe of the rainbow". Awenatchela means "people at the source [of a river]". The city of Wenatchee shares its name with the Wenatchee River, Lake Wenatchee and the Wenatchee National Forest.Wenatchee is known as the "Apple Capital of the World" due to the valley's many orchards. The city is also sometimes referred to as the "Buckle of the Power Belt of the Great Northwest". The "Power Belt of the Great Northwest" is a metaphor for the series of hydroelectric dams on the Columbia River. Rock Island Dam is located nearest to the middle of this "belt", and so was labeled the "Buckle". This saying is printed at the top of every issue of Wenatchee's newspaper, the Wenatchee World, and is no longer in common use elsewhere. It was revealed on February 19th, 2019 that Patricia Ann McKinney (Bigley) perished in Houston, Minnesota. Ms. McKinney was 70 years old and was born in Wenatchee, WA. Send flowers to share your condolences and honor Patricia Ann's life. It was reported on February 12th, 2019 that Donald Schellin Dr Smith perished in Wenatchee, Washington. Smith was 94 years old and was born in Chicago, IL. Send flowers to share your condolences and honor Donald Schellin Dr's life. It was revealed on January 13th, 2019 that Connie Acosta passed on in Wenatchee, Washington. Acosta was 90 years old and was born in Chicago, IL. Send flowers to express your sorrow and honor Connie's life. It was noted by The Herald on November 18th, 2018 that Peter Patrick Vanwagnen passed on in Wenatchee, Washington. Vanwagnen was 80 years old. Send flowers to express your sympathy and honor Peter Patrick's life. It was noted by The Herald on October 7th, 2018 that Elmer Eugene Walcker passed on in Wenatchee, Washington. Walcker was 89 years old and was born in Turtle Lake, ND. Send flowers to express your sorrow and honor Elmer Eugene's life. It was disclosed by The Herald on September 12th, 2018 that William Lee Vanmechelen passed on in Wenatchee, Washington. Vanmechelen was 46 years old. Send flowers to share your condolences and honor William Lee's life. It was disclosed by The Herald on August 21st, 2018 that Patricia E Conley (Lines) died in Wenatchee, Washington. Ms. Conley was 86 years old. Send flowers to express your sorrow and honor Patricia E's life. It was reported by The Herald on July 15th, 2018 that Mary Ellis Elwell (Masseth) passed away in Wenatchee, Washington. Ms. Elwell was 81 years old and was born in Bismarck, ND. Send flowers to express your sympathy and honor Mary Ellis's life. It was disclosed by The Herald on July 15th, 2018 that Dolores M "Dee" Wilson perished in Wenatchee, Washington. Wilson was 88 years old. Send flowers to express your sympathy and honor Dolores M "Dee"'s life. It was revealed on June 27th, 2018 that William Angus Kerr passed on in Wenatchee, Washington. Kerr was 86 years old and was born in Oban S, CT. Send flowers to express your sympathy and honor William Angus's life. The Columbia River and nearby mountains and sagebrush steppes provided an ample supply of food. Located at the confluence of the Wenatchee River and Columbia River rivers near the eastern foothills of the Cascade Range, Wenatchee lies on the western side of the Columbia River, across from the city of East Wenatchee, Washington Wenatchee. The population was 27,856 at the 2000 United States Census census. He was followed some 20 years later by Father De Grassi, who built a log cabin on the Wenatchee River near the present town of Cashmere, Washington Throughout the 1800s other white settlers came to homestead the land. In 1863, Father Respari, a Catholic priest, began his missionary work with the Indians. The official website for the city of Wenatchee is http://www.wenatcheewa.gov. We work with local florists and flower shops to offer same day delivery. You will find budget sympathy flowers in Wenatchee here. Our funeral flowers are cheap in price but not in value.